I have been really into my newest game design over the last few weeks called Memaw’s Monsters. I’m excited to document my process of creating my game from start to finish. The following is a recap of several Facebook posts I made on the Streamlined Gaming Facebook Page. (5/26/2018) Getting the printer ready for my first print run of my newest prototype. Me and nasus are both pumped in this video. I look forward to sharing my game design (and creation) process with you all! (5/26) Talking about my newest prototype as the first set of monsters get printed at my apartment. It feels exciting finally having my game idea come together after 3 weeks of planning it out! I still have several decks of cards to go but this is a fun start. Here is the 4 minute video of me explaining Memaw’s Monsters as it gets printed. 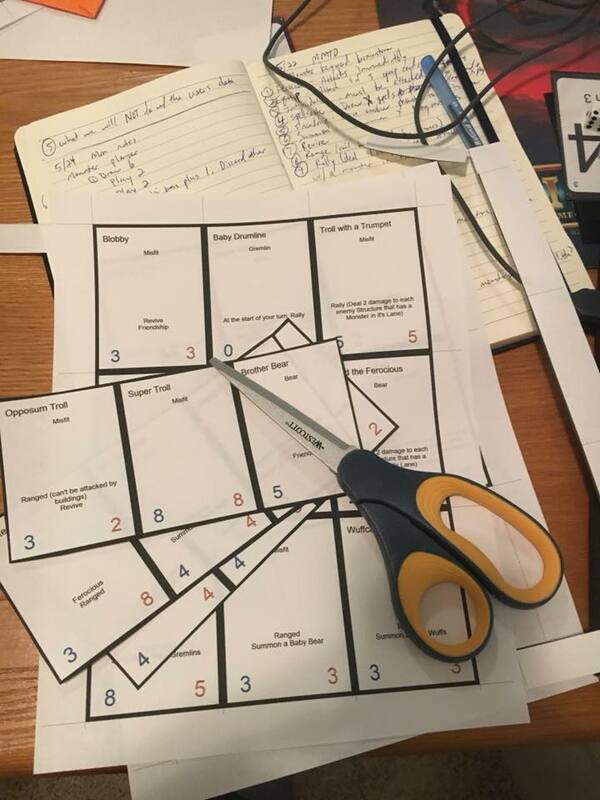 (5/27) Getting this prototype closer and closer to being played for the first time. 3. Sleeving up the freshly cut cards! 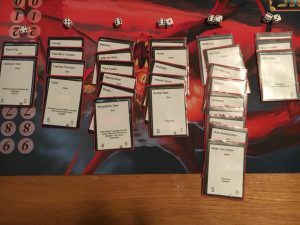 (5/27) Trying to make the game semi balanced before the first play test. After I printed off the cards I layed them out and looked at “the curve” of the monsters health. Doing this will help me analyze and understand some of the math behind my initial game design. “The curve” is a popular term in trading card games that refers to the mathematical “curve” of something. Usually it’s used to talk about how many of each card you have in your deck for each cost. Im using it in a slightly different way. For example, the way I’m analyzing “the curve” of my cards is by laying them out on the table and seeing the health stats of each card. My monster cards have added health that equal 4-9 health. As you can see in the image I have a LOT of cards that equal 8 health. Once laid out, I was able to quickly add them up and get the average health of all the monster cards (6.5 ish was the average). 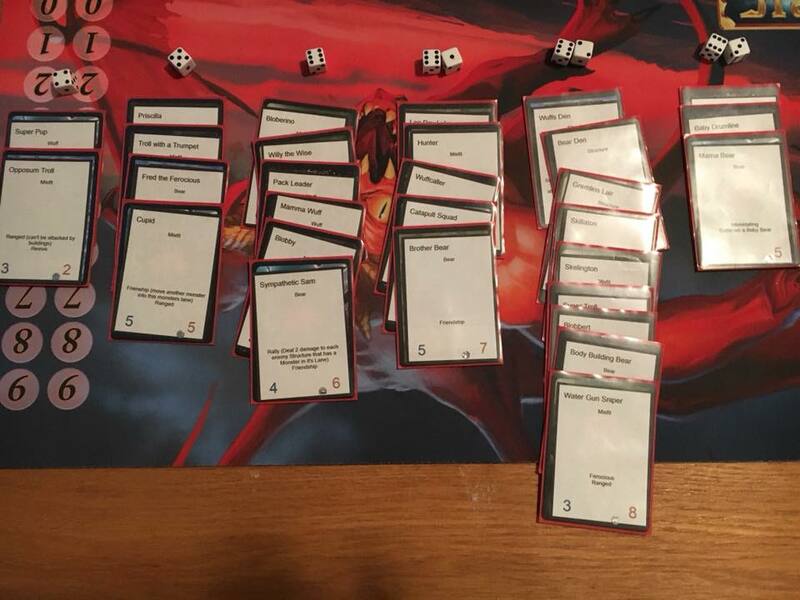 Now that I know the average health of monsters, I can create the defensive cards much easier and more balanced because I now know how much health the defense will need to fend off. I just made the towers for the defense player and can now make the rest of their cards. 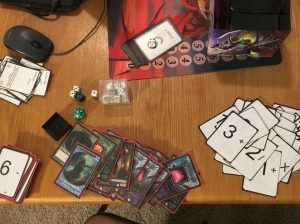 What kind of things do you like doing as the control player in card games? – preventing damage or negating it. Am I missing other obvious fun experiences the control players usually end up doing? Randy and Jim reminded me about making the control decks fun in a way that not toxic to the rush/offense. 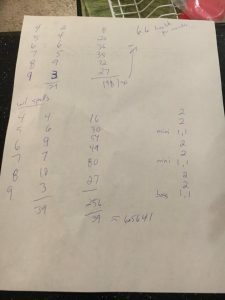 (5/29) Finding my brain stuck in an endless loop and discovering how to resolve the issue. I was having trouble trying to figure out what kind of tools (cards) I wanted to give the defensive player in my new Tower Defense game. At one point I noticed that my brain was just thinking over many options repeatedly. While it FELT like I was making progress, I was in fact going nowhere but in constant circles. Now that I realized I was stuck in a loop, I could analyze what happened and see how to fix it. I plan on focusing on 1 direction at a time for the defensive cards and creating them that way. This will help me focus my energy and start progressing. 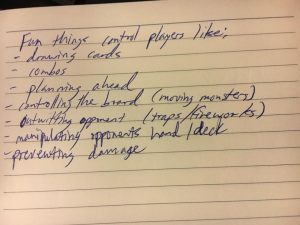 I have a little time before my first playtest session and want to make sure I’m ready with at least SOMETHING to try out! What is a good keyword for “target tower you control attacks immediately”? I actually JUST thought of “Reload” as I wrote this post and kind of like it but don’t really like the others very well. What comes to your mind for the keyword for this type of defensive effect? 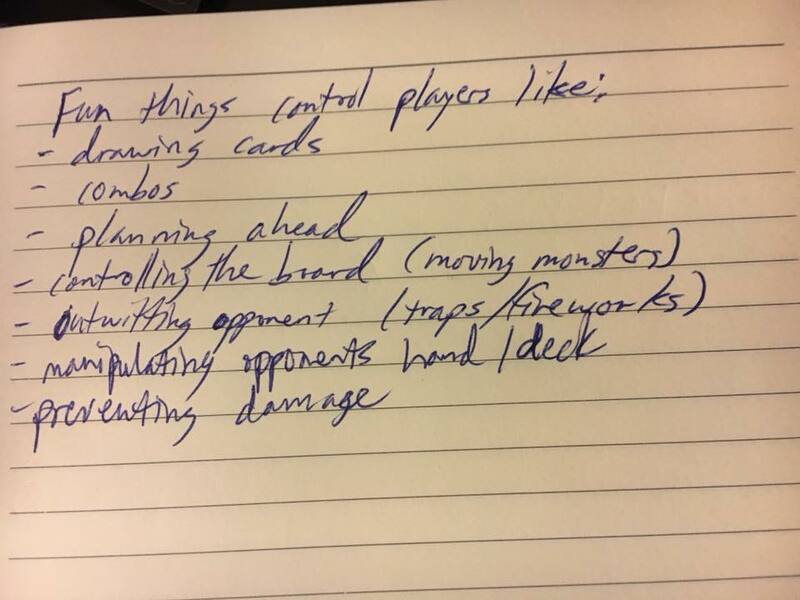 (5/30) Trying to Build a Strong Foundation for How the Defensive Cards Will Play While Having a Good Game Balance. So I’m finally making progress on the defensive cards after about a week of being done making the offensive cards (monsters). Creating a strong backbone to my game, Memaw’s Monsters, is really difficult. But once I have the backbone created, I will be able to make up new cards VERY quickly as there would be a strong reference for power level of each card. For example, the resource system I have in place right now for the defensive players turn is this: The def. player has 6 “energy” (resources) that they can spend to cast spells and traps. 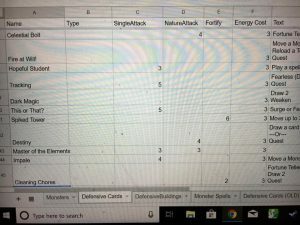 Because I have already done the math on my Monster cards and know about how much health each of them will be sending per turn, I can now set guidelines for how strong the defensive cards need to be. With the offensive player sending about 6.5 health per monster…. Uh oh… I just realized they are sending 6.5 health per monster and not per TURN!!! Oopss. haha. So the monster player will be sending around 13 health of monsters on an average turn!!! haha! I can now go back in and continue creating the Defensive cards to match this. I have a good idea of what I want the Def. cards to do now so it will just be a matter of updating the damage/stats of the individual cards. Anyways… here is a picture of my Google Sheet I am working in. 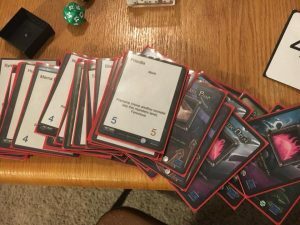 I am able to access it through NanDeck which I can use to quickly print and easily update my cards with in between each playtest. Thanks for all of the advice and feedback that you have given so far. It is helpful and inspiring to me. Back to the Google Sheet I go!!! I’m really excited to finally be getting this idea out of my head and onto paper. Sleeving up such a complex set of ideas feels good after having them roll around in my head for weeks on end. Today I am still working through the defensive cards after (thankfully) noticing that my math was off by 2x what it should have been, yesterday! I originally had cards dealing something like “4, 2” damage in a lane. So 4 damage to one monster and 2 to another monster in that lane. Or “1,1,1” which dealt 1 damage to each of up to three different monsters in that lane. Now I have replaced that with a much more streamlined version. My “AOE”, or Area of Effect type of cards are now “NatureAttack”. So if a card would deal 6 nature damage, you would split up 6 damage as you wish to monsters in that lane. Another cool thing I’m trying is having a “Helper” deck. As the defensive player casts spells, there is a “Quest” keyword. Once you receive a certain amount of quests, you can draw a helper card from the helper deck. These cards have energy costs like your normal cards but do very powerful things. I learned this mechanic from Faeria, a digital tactics card game. It’s also perfect for the theme of Memaw’s Monsters because we often had the same characters (Henry the Elf and Whaley the Whale) help us with the monsters. Fun stuff and I’m really excited to get to play tomorrow. Woohooo!! Here’s to us getting to play more than 10 minutes before figuring out all of the broken cards/mechanics. 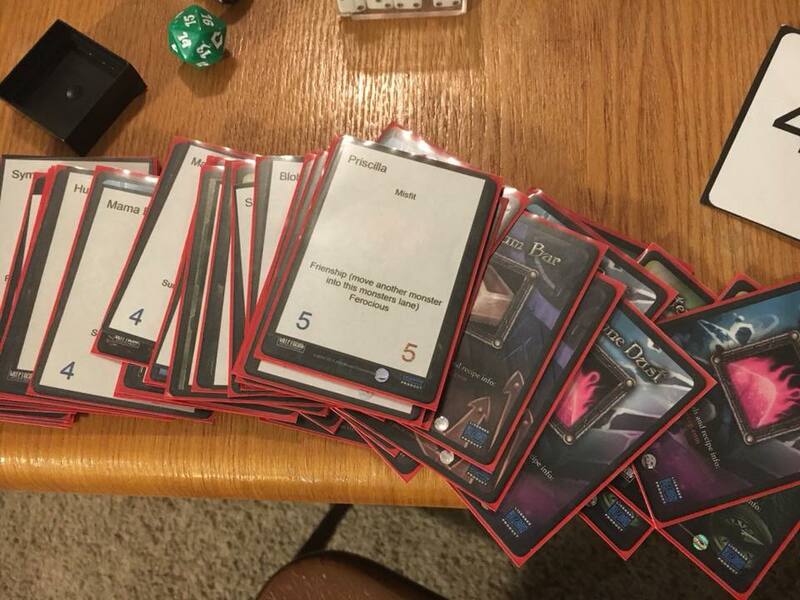 I finally got a rough draft of the Defensive cards done. Making the prototypes in NanDeck has saved me MANY hours of time and frustration over the years so I wanted to share this process with you. I’m hoping my process can save you time too! Also, thanks to everyone for the inspiration and encouragement. It means a lot to me! Who needs an alarm clock when it’s playtest day?!?! I rushed to add some names to the cards. 1. 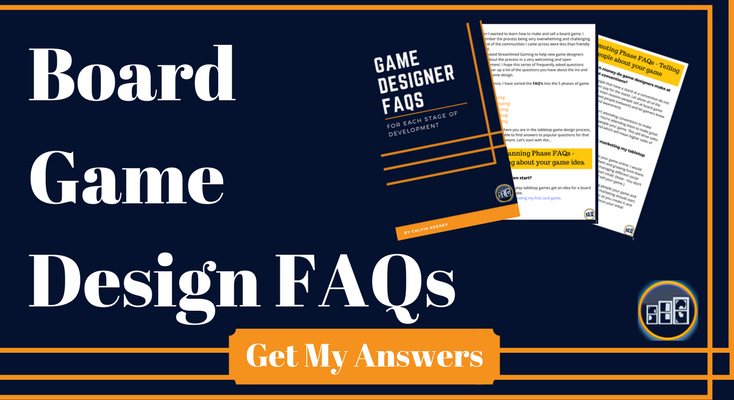 I’m hoping this will help the players be able to ask questions about the defensive cards more efficiently. 2. And I’m wanting the names to spark some thought about what names might work best with the game theme. I have some names that sound like spells (“fireball”). Some that sound like mindsets (“mindfulness”). And some that sound like achievements (“cleaning chores”). These words remind me of things that are common with kids and some things we did at memaw’s growing up. I’m still excited and hopeful I get to do the first play test here in a few hours. Woohooo! Awaiting the First Playtest of Memaw’s Monsters! I’m so excited to get to play Memaw’s Monsters for the first time and I also look forward to sharing the experience with you! I think it’s going to be really cool looking back on this process in the following years. Hopefully it will be semi entertaining in the near term as well!